Chip Michael’s piano duet Amaranthinesque starts softly with a persistence that causes the listener to anticipate eagerly for more. 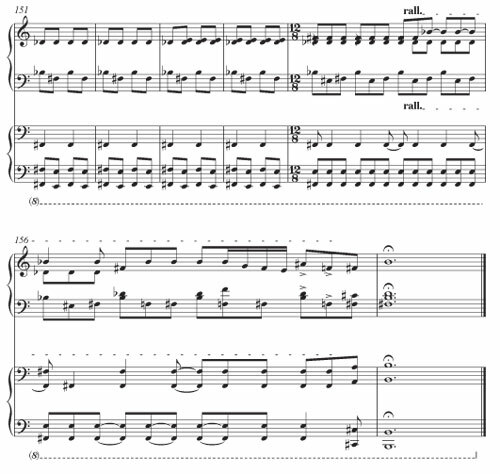 The 21-page piano duet “Amaranthinesque” begins with the primo repeating 90 high E’s (i.e. 7 bars of a set of 4 triplets of the single high E note in the right hand) before descending to the first rehearsal mark shown below. 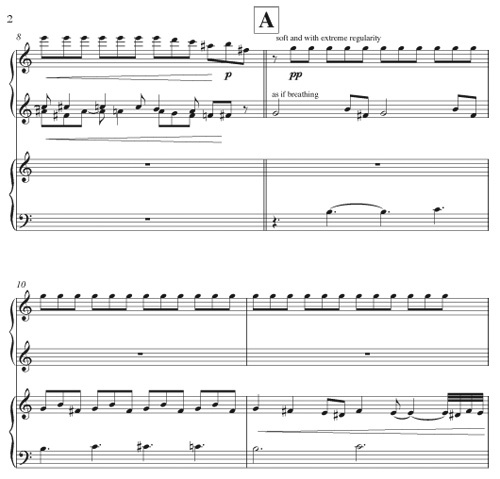 The left hand also begins pianissimo but in a single minor third and gradually breaks into a two-voice melody taken over by the secundo in bar 10. I was intrigued by this piece but also realised that the page turns might be problematic without a third person at our disposal. Chip Michael had already specified the need for a page turner in his first e-mail to me. Luckly Brendan Kinsella, who sightread and recorded the duet with me, knew the trick to turning pages and playing at the same time. He gently folded the loose sheets vertically in half. Playing the secundo part allowed him to multi-task as page turner. Due to the sheer length of this work, we were not able to record it in its entirety for this blog post. Click below to get an idea of this duet. When I later played the secundo part, it felt like a different piece. I daresay that the part you choose in a duet very much determines the experience you have. I would suggest players switch parts just for the fun of it — and for variety’s sake. The duet develops with repetitive triplets appearing in different places — an overarching theme of persistence, constancy, and permanence. 155 bars and many voices later, it slows down to a majestic B minor chord. Chip Michael also sent several solo piano pieces I’m eager to try out — just as soon as I clear my backlog of duets from my Call for Scores project to review. Amaranthus, collectively known as amaranth, is a cosmopolitan genus of herbs particularly easy to grow and considered a symbol of indigenous culture. Rich in protein, amaranth is a great source of nutrition avoiding the gluten issues of wheat. It also grows in a broad variety of climates making it an ideal crop. However, European interests and American corporate farming has made global harvesting and distribution of amaranth fiscally undesirable. This piece takes its attitude from the plant, constant, perpetual, everlasting. Mozart sells itself just as Hawaii sells itself. The new all Mozart programme of the Bekkers Piano Guitar Duo includes Bekkers arrangement of the Overture to the Magic Flute and Eine Kleine Nachtmusik. Viva Mozart! Voila! During the two months Robert and I lived on opposite ends of the earth, he in the Netherlands and I in Hawaii, literally 12 time zones apart, I got involved in the local classical music scene in Maui. My blog “Maui Tips for Newcomers by a Newcomer” documents some of these activities but leaves out several important events that lead to where I am at today. Barely a week after I returned to Holland at the end of May 2011, we had to prepare to give a concert in Warnsveld. We had not practised together for months. We had to come up with a new programme. What was possible and do-able in the short space of 5 days? Mozart came to the rescue. Just a month earlier I had turned pages for Katherine Collier, the pianist and developer of “Amadeus-The Magical Life and Music of Mozart” the opening concert of the 30th Anniversary of the Maui Classical Music Festival. The previous time I had visited the venue of the Makawao Union Church, I was the pianist. In fact, it was the very place where Robert and I gave our first public concert in the USA (not counting Houston Public Radio and the two house concerts in Houston that same month in 2007). Collier’s Mozart was a brilliant programme, narrated by the Hawaii Public Radio announcer Howard Dicus. Ms Collier wore a white wig and dressed as Mozart. Each string instrument had a motif representing the main characters in Mozart’s life — his dad, his mom, his sister, his wife. The story of the child prodigy was told through music and narration. The audience got to sample a variety of his music: piano solo, string quartet, opera extracts, aria, etc. Several weeks later while visiting friends in Colorado, I watched the director’s cut of the movie Amadeus. I was once more reminded of the ephemeral popularity of Mozart. Mozart sells itself just as Hawaii sells itself. People will attend a concert of Mozart’s music, just as people will visit Hawaii (if they can afford the time and airfare). There is no need for embellishment or hard sell. Our duo has more than enough Mozart for a full concert (45 minutes + intermission + 30 minutes). For the one hour programme without intermission, we have to choose what to leave out. We left out Carulli’s Variazione Sopra un Tema del Flauto magico di Mozart by Beethoven, op. 169 which we played extensively in 2007-2008. Hot off the press is Robert’s new arrangement of the Overture to the Magic Flute and the rest of the Eine Kleine Nachtmusik. The audience at the 3rd June concert in Warnsveld loved our programme. It was not difficult to do. Why did it take us 10 years to figure it out? We had been varying our programme as often as once every month, including difficult pieces such as the 30-minute long Grand Potpourri National which took months to get ready. 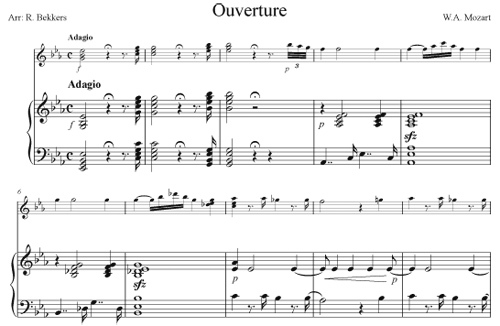 The page programme (PDF) of Viva Mozart! is ready to rock and roll. Our next concerts in the Netherlands are Sunday 26 June 2011 in Zeist, Thursday 7th July in Utrecht, and Sunday 17th July in Amsterdam. Author BLOGmaidenPosted on June 19, 2011 Categories arrangement, audience, composer, composition, concert, guitar, piano, planning, rehearsal, research, review, sheet music, travel, venuesTags arrangements, classical music festival, Colorado, concert program, concert programme, Hawaii, Holland, Katherine Collier, Magic Flute, Marriage of Figaro, Maui, Mozart, Netherlands, overture, page turner, piano guitar duo, Robert Bekkers, Utrecht, Warnsveld1 Comment on Viva Mozart! When is a live performance a concert? Dictionary.com defines concert as a noun: a public musical performance in which singer(s) and/or performer(s) participate. By this definition, there is no requirement for an audience to be present. I would argue that the presence of listeners makes a huge difference to the performance. Knowing that there are listeners changes the way a performer performs. Knowing that the performance is being recorded, such as the presence of a microphone, changes the outcome. One definition of public is “open to all.” In reality, this is the most difficult requirement to meet. To make “public” means to “publicise,” i.e. let the world know that such a performance will happen. This requires a certain amount of lead time, a broadcast mechanism, and a distribution list, all of which requires time, money, and resources. Our main criterion in our US concert tour for choosing where to go was “where we give a concert.” I asked my contacts in Colorado to help us find a venue to give a concert. Two tried but did not succeed given the short notice. In the end, I asked singer/songwriter Melissa Axel to open up her home for an impromptu small concert. The definition of concert does not specify that the performers should get paid or that the audience should pay. It does not give a requirement for the duration or the size. After Houston, we flew to Denver on 15th November 2010. It was to be a whirlwind visit — a 2 night stopover before San Francisco, but our very first visit to Denver, Colorado nevertheless. We were determined to share our music even though we did not have enough time to plan the visit or stay long enough. Our host Marty drove us to Melissa’s home in Denver at 6 pm. Melissa and James welcomed us with hot tea and other drinks. The other guests Mark (whom I’ve not seen in nearly 25 years and who fetched us from the airport) and his wife Laura arrived soon after. We sat down just after 6:30 pm and gave a short concert before Marty had to leave. 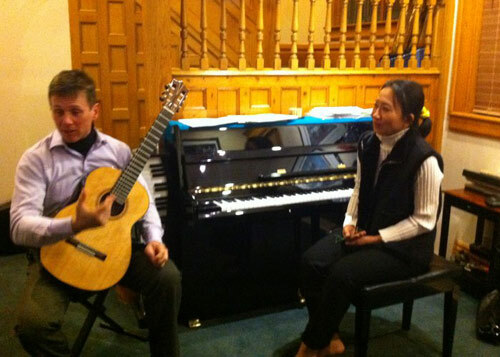 Around 7 pm, we asked Melissa and James to play something. Theirs were original work of Melissa who sang and played the piano while James played the tuba — a remarkable combination. To support the album and get your copy in advance (download, CD, vinyl LP, plus other exclusive goodies), PLEASE PLEDGE NOW! Read more about it. Melissa’s website is outstanding. Her music is beautiful. Let’s hope the world is kind and generous. Here’s a toast to kickstart the pledges! !